Because, of course there were. That’s how Italian grandma’s roll. Unfortunately, none of us ever baked right alongside my grandma when she made her biscotti (they always magically appeared! ), and her recipe was rather cryptic – no amount of flour, no oven time, no flavoring amount. Last Christmas, my mom and I tackled the trial and error project of getting the recipe as close as we could. After a few different batches, a lot of dough-feeling and experimenting with flavorings, we finally nailed it! One of the unique things that my grandma did with her biscotti was to use butternut flavoring as opposed to the traditional anise. I personally love anise, but my extended family is split at best on it, and I think more people than not dislike it. Since she always aimed to please, my grandma stopped using anise and adopted the vanilla butternut flavoring, which became her signature biscotti flavor. My grandma would buy the imitation vanilla butter & nut flavoring from the small grocery store in her town, but if you want to amp up the flavor, you could buy pure vanilla-butternut flavor from King Arthur Flour. The other thing the family had always been split on was nuts. Some loved chopped walnuts in the biscotti, while others wouldn’t touch them if they had nuts. Again wanting everyone to be happy, my grandma would make half of her batches with nuts and the other half without. When you make these, feel free to throw them in or leave them out, or use your favorite nut. When I was younger, I would often pour myself a half cup of coffee, then sit at the table and dunk, dunk, dunk. 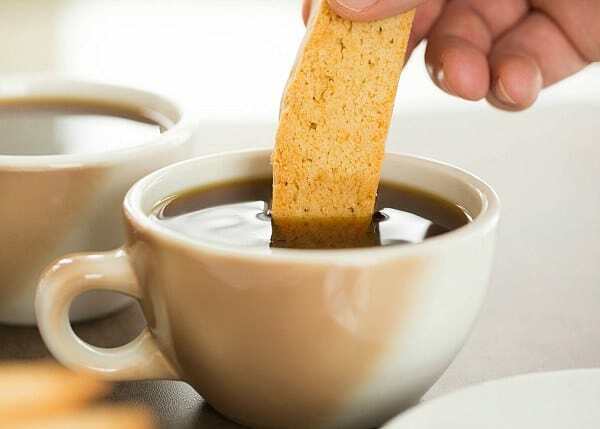 I’ve never been a coffee drinker, but to me, there is no better way to enjoy a good biscotti than by dunking it in a cup of coffee. I wish my grandma were still around and we could sit at her dining room table or mine and chat over a plate of biscotti and cups of coffee. One day. 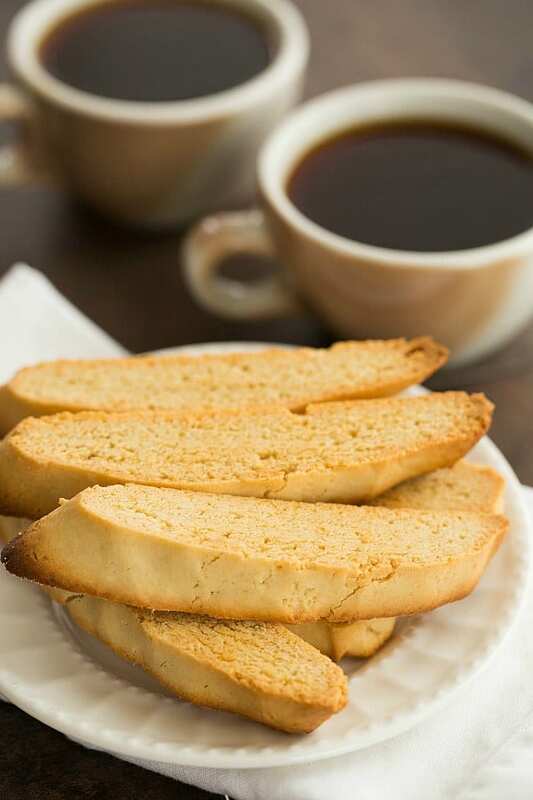 My grandma's biscotti recipe - a family favorite for decades! 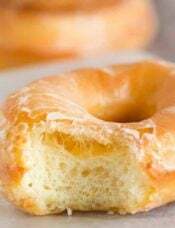 Using an electric mixer, beat the eggs and sugar on medium speed until the mixture is pale yellow, about 3 minutes. Add the oil, milk, and butternut flavoring, and mix for an additional 1 to 2 minutes until completely combined. Reduce the mixer speed to low and gradually add the flour and baking powder, mixing only until just combined. Give the mixture a final stir with a rubber spatula, and fold in the walnuts (if using). Divide the dough into four equal pieces and shape each into a log about 9 inches long by 3 inches wide. Place two on each sheet and bake for 20 to 25 minutes, or until firm to the touch. Remove from the oven and place the pans on cooling racks for 10 to 15 minutes, or until you can handle the biscotti easily. Using a sharp knife, slice each log on the diagonal into ½-inch slices. Arrange the slices cut side-up on the baking sheets and return to the oven for an additional 10 to 15 minutes, or until golden brown, flipping them halfway through. Allow the biscotti to cool on the baking sheets, then store in an airtight container at room temperature for up to 1 month. 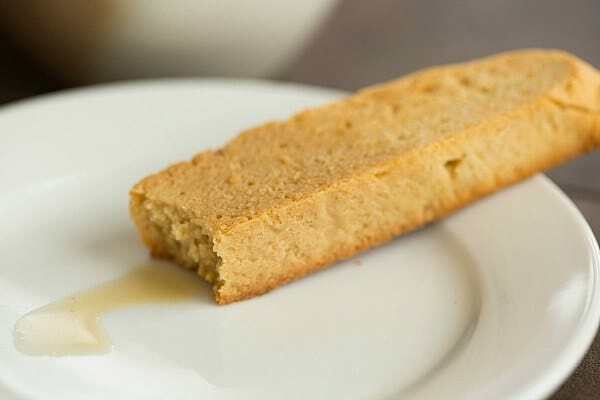 Hi Michelle, while this recipe looks delicious, WHAT HAPPENED to my beloved biscotti recipe that was here before? The christmas baking basic biscotti. It was my go-to recipe and I can’t find it, it’s only linking to Grandmas biscotti recipe. Please help!! Hi Christine, Is this the recipe you’re referring to? YES!! Oh thank you thank you. I have the link saved to this recipe on Pinterest but when I clicked it, it was going to your other recipe with the butternut flavoring. I tried searching for this one a thousand ways and couldn’t find it. This biscotti is a staple in my house! Thank you! 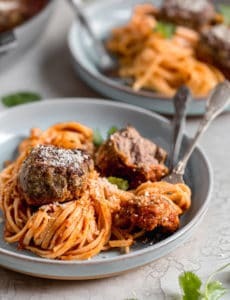 Want to try this recipe but would like to substitute butter for oil. What do you think! Hi Neil, You can do that, but it does alter the texture of the biscotti a bit. Thanks for the biscotti recipe. I dont have anise extract, can i use real anisette????? If yes, how much should i use equal to the extract? Thanks for reply. Hi Kat, Do you mean anisette as the liquor? 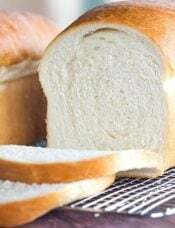 It’s not as concentrated so you would need to use much more and it would affect the texture of the dough. I would instead recommend anise oil, and use half as much as the extract. Also I forgot to ask, how much of the walnuts and cherries would you add to this recipe ? Hi Linda, I would do 1 cup walnuts and 1 cup cherries. Enjoy! A while ago I had some Biscotti made with cherries and walnuts. They were delicious. 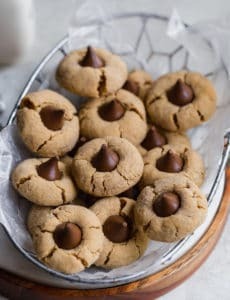 If I used this recipe adding walnuts and well drained chopped Maraschino Cherries, do you think they would come out ok? Hi Linda, Yes you could totally do that! This makes a giant batch of biscotti! I personalized the flavor by switching out butternut flavoring with instant coffee and adding black walnuts. 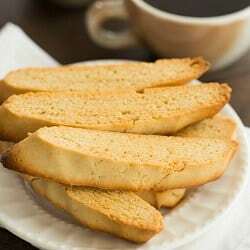 This makes a wonderful autumnal biscotti perfect for coffee dunking! Bakers were wondering how to store Biscotti. I have a large old glass mayonnaise jar, probably gallon size, where I store my Biscotti. It is always perfect, never dry! Glass is great! Hi Kat, My grandma always used oil, but I’ve seen a lot of recipes stating that butter and oil give slightly different textures to the biscotti. I’m sure it will still be delicious! Didn’t know the butternut flavouring existed. Thank you for that and the recipe. It’s currently in the oven as I type this…. And smelled divine. Only question I have is that it bent my whisk for the stand mixer… So I was wondering if yours was more sturdy (didn’t have that problem) or if you switch to hand mixing or a different attachment when the flour makes it too thick? Oh no! I’ve never had this happen! You could certainly mix by hand at the end if it’s too thick for the mixer. I made this recipe exactly as directed. ABSOLUTELY WONDERFUL! 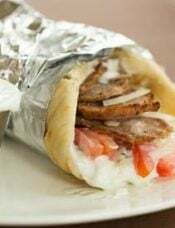 As always, your directions are easy to follow, and the results are so delicious. I thought biscotti was supposed to be difficult. Not so. Also, I am so glad you recommended the butternut flavoring. What a find! Thank you so much for this recipe and the KA butternut flavor recommendation. I ordered it and made the biscotti right away. I’ve learned to trust you and your recipes. This is fantastic and easy to follow, as always. I love your blog and stories, they are wonderful! 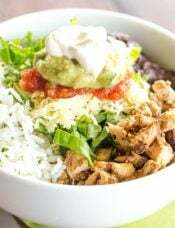 Can I easily halve this recipe? I love biscotti but 6 dozen is a lot for me and my husband to eat on our own (because we would). Hi Rachel, Aw thank you! Yes, you can halve the recipe without an issue. Enjoy! Can you please let me know which brand of butternut flavoring do you use? I have never heard of it until now. I’ve been making and thoroughly enjoying these biscotti for a few months now. I do have a question though. I can only cram 6 cups of flour into the recipe. Should I add more milk? I certainly have no objection to ending up with more biscotti! Hi Sue, I’m so glad you’ve been enjoying these! I would add the full amount of flour and if it’s too dry, then yes, adding more milk would be okay. I just made a batch of your biscotti. Inspired by your Gramma story, I chose your recipe over several others! I went for the toasted walnut addition due to the fact that I only had regular vanilla on hand for flavoring. They’re not quite cool yet, but was wondering two things? a) is the dough supposed to be so tough that scraping the bowl empty takes two hands? (lol) and b) when complete are they a very dry biscotti or a little bit softer in texture? I am hoping to tweak this to perfection! Tastes great though! (I could not wait to test one). 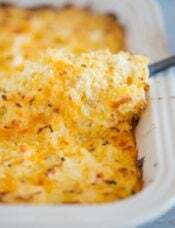 Wonderful stories and very easy recipe! Thank you. I too am from an Italian family that grew up on biscotti’s year round. I’d give ANYTHING to have my grandmother back for even one hour. I love sharing her recipes. Since your grandmother made large batches I wonder if you’d share your ideas about storage of the biscotti. I have found that tupperware storage takes the crispness out of them. I store my pizalle waffles in large tins with covers. I would do the same with biscotti. Care to comment? My mother used both tins and Tupperware to store pizzelle and biscotti. The secret is to make sure their thoroughly cooled before stacking. They can store for months! Definitely gotta use butternut! It really does add the extra something, I’ve been making biscotti off and on for years and lose the specific recipes in between, but I’ve run out of butternut and had trouble finding it again and tried making it without and they just aren’t as good. I was actually about to make a batch now that it’s getting really cold again and I’m back on my hot coffee diet again. Lol….Anyways I came across your post and I was so happy to see your tip on butternut bc most people don’t know about it. I came. A r it by accident years ago making homemade fondant and got a tip to use it to make more of a tootsie roll flavor and have loved it since, I personally favor it more then vanilla now lol. 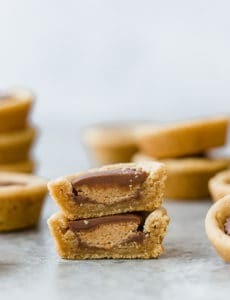 Hi Pam , I tried the biscotti repcie but I found it hard to slice them into thin slices and secondly how do I make them a little less hard and a little more softer ? any tips on that ? These look like the perfect classic biscotti. That last paragraph brought a tear to my eye. I wish I could spend more time with her every day. i never heard of the butternut flavoring. will have to try it. they look great for tea! We make biscotti’s every so often but they really are a treat!!! 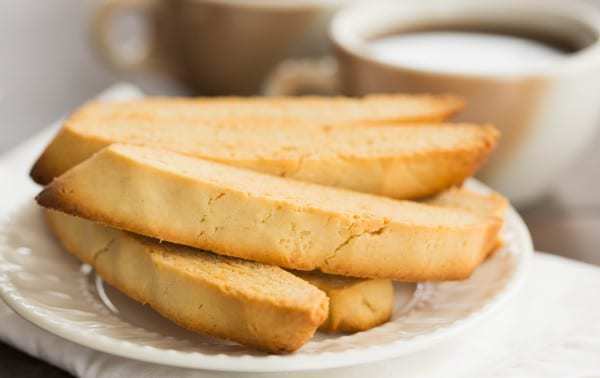 I am glad your able to share this recipe – biscotti’s are a classic that everyone needs a taste of! I love family recipes. I can’t wait to try your Grandmother’s Biscotti recipe. I’ve taught my sister how to make my Grandmother’s pizzelle recipe with the same non-electric iron as my Grandmother’s iron. It’s important to keep the memories and traditions in the family. Making biscotti is such a treat–I also adore old-timer recipes. One time my aunt shared an old jello cheesecake recipe with me that simply said “3 cups whip cream” and I asked if that meant pre-whipping or ‘whipped’ cream, and she just gave me a funny sidelong look and said, “cream, of course.” D’oh. 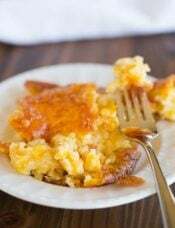 Still, there’s nothing like it, and I can’t wait to try this recipe–thanks for sharing!